Photos: What’s behind the Oromo protests? Eidtor’s Note: Awol K. Allo is LSE Fellow in Human Rights at the Centre for the Study of Human Rights. 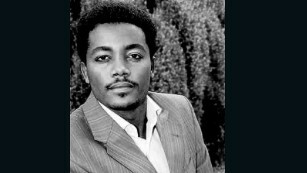 He writes on the issues behind several months of protests by Ethiopia’s largest ethnic group, the Oromos. Around 100 people died following clashes with security forces and demonstrators at the weekend, according to Amnesty International. The opinions shared below are solely that of the author’s. LONDON (CNN) —Ethiopia is facing a crisis of unprecedented magnitude, yet its government and Western enablers refuse to acknowledge and recognize the depth of the crisis. 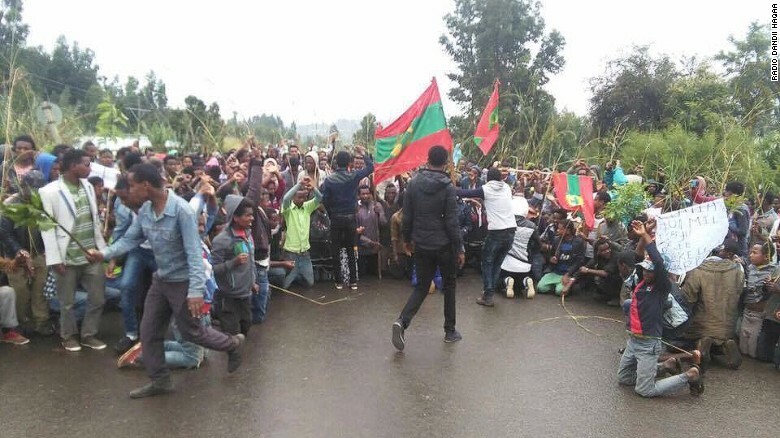 The protests took place in more than 200 towns and villages across Oromia, Ethiopia’s largest region, and were attended by hundreds of thousands of people. According to Oromia media Network, security forces used live bullets against peaceful protestors, killing over 100 protestors. Oromos have been staging protest rallies across the country since April of 2014 against systematic marginalization and persecution of ethnic Oromos. 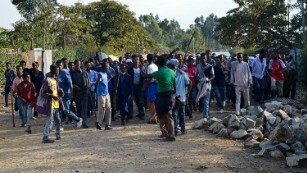 The immediate trigger of the protest was a development plan that sought to expand the territorial limits of Ethiopia’s capital, Addis Ababa, into neighbouring Oromo villages and towns. When the protest resumed in November of 2015, the government dismissed the protestors as anti-peace elements and accused them of acting in unison with terrorist groups — a common tactic used by the government to crackdown on dissent and opposition. The government used overwhelming force to crush the protest, killing hundreds of protestors and arresting thousands. In its recent report titled “Such a Brutal Crack Down”, Human Rights Watch criticized the “excessive and lethal force” used by security forces against “largely peaceful protestors” and puts the number of deaths at over 400. The Oromo make up well over a third of Ethiopia’s 100 million people. Historically, Oromos have been pushed to the margin of the country’s political and social life and rendered unworthy of respect and consideration. Oromos saw themselves as parts of no part — those who belong to the country but have no say in it, those who can speak but whose voices are heard as a noise, not a discourse. This allowed the ruling Ethiopian People’s Revolutionary Democratic Front and Tigrayan elites to present themselves as the only political movement in the country that could provide the stability and continuity sought by regional and global powers with vested interest in the region. In its 2015 comprehensive country report titled “Because I am Oromo”, Amnesty International found evidence of systematic and widespread patterns of indiscriminate and disproportionate attack against the Oromo simply because they are Oromos. In 2015, Undersecretary of State for Political Affairs Wendy Sherman praised Ethiopia as “a democracy that is moving forward in an election that we expect to be free, fair, credible, open and inclusive.” She further added, “”Every time there is an election, it gets better and better.” That election ended with the ruling party winning 100% of the seats in parliament by wiping out the one opposition in the previous parliament. The US led ‘war on terror’, started by President George Bush, provided the government with a political and legal instrument with which the government justified severe restrictions on freedom of expression, assembly, and association. The Amharas and Oromos, which constitute well over two-third of the country’s population, are seen as ‘historical antagonists’. The ruling party transformed this antagonism between the two ethnic groups into a productive political tool. The Ethiopian government is in denial and making the same promises of restoring ‘law and order’ through further repression and crackdown.